Photo Caption: (From 2nd from Left) Andrew Park, Honorary Consul of Thailand, Royal Thai Consulate-General Queensland; Nadda Buranasiri, AirAsia X Group CEO and Thai AirAsia X CEO; Hon. Kate James, Minister of Tourism Industry Development for Queensland Government; Gert-Jan de Graaf, Brisbane Airport Corporation CEO; Andrew Park and Ms Suladda Sarutilavan, Director of Tourism Authority of Thailand flanked by AirAsia cabin crew at the announcement today. 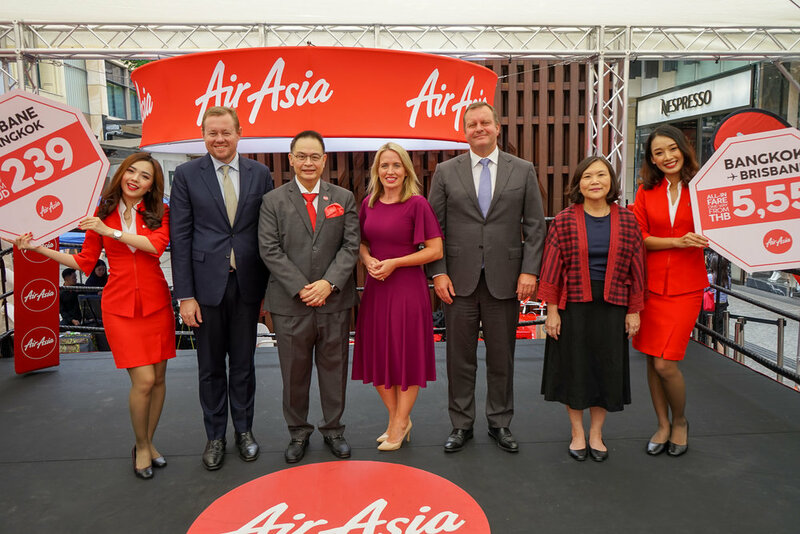 BRISBANE, 7 February 2019: AirAsia, the world’s best low-cost airline announced it would operate its first-ever Australian services from Bangkok, Thailand to Brisbane, Australia from 25 June 2019. AirAsia X Group CEO Nadda Buranasiri said, “Queensland became AirAsia’s home in Australia when the first AirAsia X flight touched down on the Gold Coast in November 2007. Since that time, we’ve carried more than 2 million passengers to and from the sunshine state. *Valid for booking 07FEB19-17FEB19 for travel 26JUN19-26OCT19. Visit airasia.com for full terms and conditions.